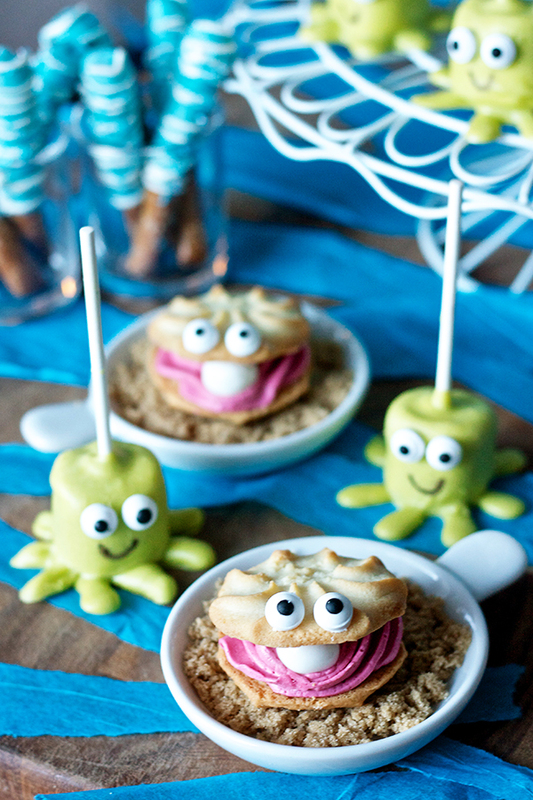 I’m taking a quick break from all of the oranges, browns, and beiges of late to bring you a little unseasonal color and subject – under the sea-themed treats! One thing I’ve learned about more than ever since working full-time with kids isn’t always the skills of pediatric dentistry, but ALL about the most popular kids shows and characters these days. Doc McStuffins, Yo Gabba Gabba, Backyardigans, Bubble Guppies – sounded more like a foreign language than a collection of kiddie shows when I first started over a year ago. But now I’m up to date with my characters and can truly consider myself on my way to becoming a proper pediatric dentist. So when one of our assistants started talking about throwing a Bubble Guppies themed party for her 2 year old, I knew I wanted to help with desserts. For those of you not in the preschool loop, Bubble Guppies is a show about a group of young merpeople (yes, that’s a word) and their under the sea adventures. I avoided making the actual characters since that can be pretty challenging, but opted for some fun aquatic friends instead. 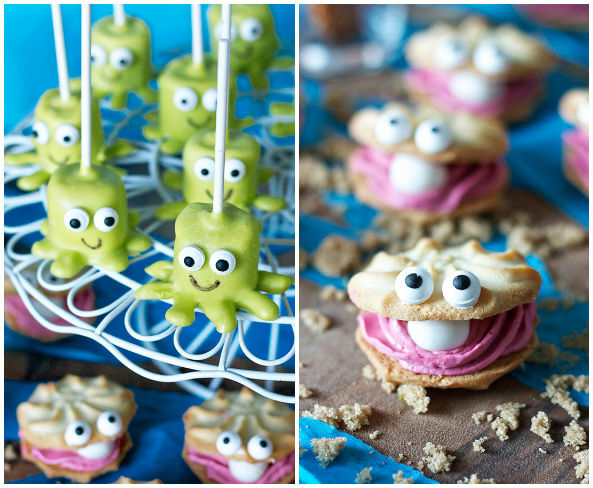 Googly-eyed marshmallow octopus pops and clam cookies ended up being adorable, easy-to-make, and perfect for the themed dessert table! There is quite a surplus of ideas for Bubble Guppies parties on Pinterest, and we scoured them for our favorite dessert ideas. 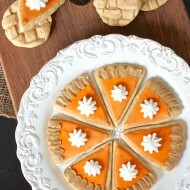 Of the treats I saw online, the clam cookies and octopus pops were my favorite and I knew they’d make a great addition to the spread. Plus, they couldn’t have been easier! I also made some blue chocolate covered pretzels because that’s such a crowd favorite and also went with the theme. Everything I made was no-bake, mostly store-bought, and could be easily reproduced by anyone with Bubble Guppies fans at home. For the clam cookies I used these Lemon Pepperidge Farm Cookies sandwiched together with some homemade frosting and a fondant pearl. But of course you could also use storebought frosting and a mini-marshmallow if you really want to make things simple. 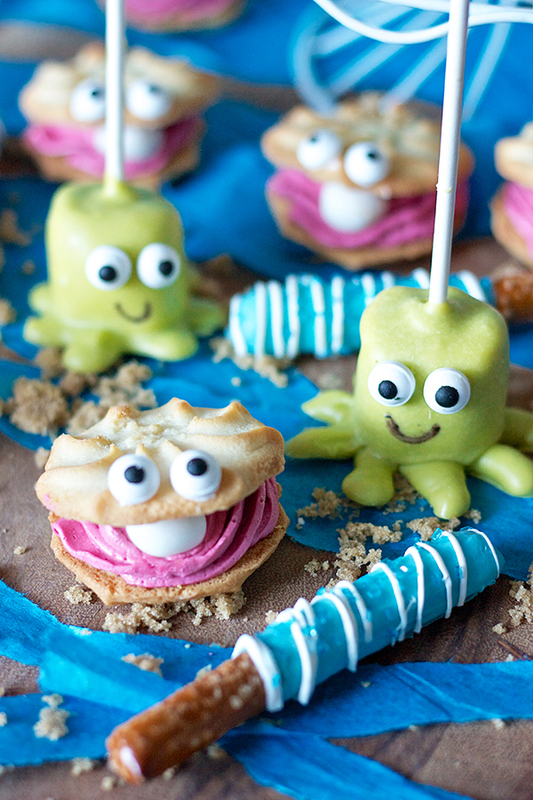 The marshmallow pops are standard marshmallows dipped in candy coating set atop piped candy coating tentacles. The googly eyes are such a fun addition (available in most craft stores) and the smiley faces were drawn on with an edible marker. Almost too cute to eat! I don’t have photos of the whole dessert table all set up, but even my little reenactment at home was pretty cute. The colors are fun, the eyes are cute (or creepy, depending on your opinion), and I think any Bubble Guppy would love to party with some sugary clams and octopi. 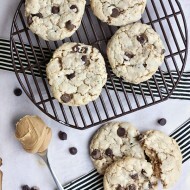 There are a lot of options here – you can make your own cookies, use other store-bought cookies, buy some frosting, make any color you want, use cake balls instead of marshmallows, change up the color of candy melts, add sprinkles, whatever you’d like! 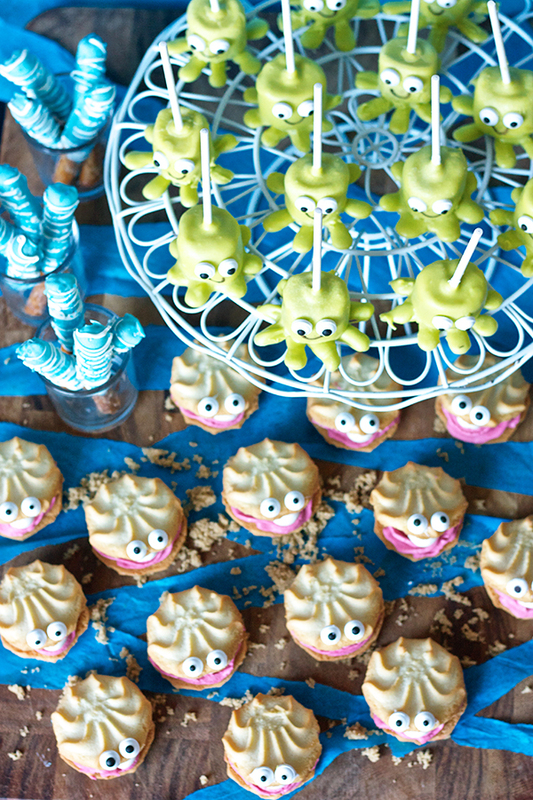 That’s the beauty of Pinterest and crazy kiddie parties – you can take your inspiration and make it your own. Although it can be overwhelming and depressing at times, Pinterest definitely has its merits! And if you’re little one is looking to be a Bubbly Guppy for Halloween, these might just be the best treats to accompany their costume. Prepare buttercream frosting (or use storebought if desired) and dye it with pink gel food coloring. Load frosting into a piping bag fit with a medium star tip. Roll fondant into small rounds to make pearls and set aside. Pipe a circle of frosting on one cookie, set a fondant pearl on top and then another cookie. Apply a little frosting to the back of two googly eyes and secure them to the top cookie. Finish the rest of the cookies and store them in an airtight container in the fridge until ready to serve. Line a cookie sheet with wax paper and set aside. Melt 4 oz of the candy melts in the microwave in 30 second intervals, stirring well between each interval, until completely smooth. Place melted candy in a piping bag with a small round tip (or ziploc bag with the corner snipped off) and pipe octopus tentacles directly onto the wax paper. Place a lollipop stick into each of the marshmallows and set aside. Melt the rest of the candy melts in a deep bowl. 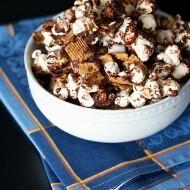 Dip the marshmallows in the candy coating, tapping the side of the bowl to shake off the excess chocolate. Place the dipped marshmallow on top of a set of "tentacles" and allow the excess chocolate dripping down to join the two parts together. Use a toothpick to smooth out any overflow. Allow the chocolate to set completely, then use any of the extra melted chocolate to attach the googley eyes. Then use an edible marker to draw on your smiles. Store in an airtight container at room temperature. Very art and funny cookies and Marshmallow Pops! I love them! If you have other kid-friendly craft tutorials, we’d love for you to submit them. If you would like to display a featured button on your site, you can get one from the right side bar of your post above. Thanks for a cute project idea!